Showing themselves to be indisputably fast through the previous two days of practice, Peugeot 908 HDI FAP racing vehicles established themselves as the rabbits for the 2010 12 Hours of Sebring. Between the two-car team of Peugeot Sport, the #07 Peugeot 908 of Marc Gene, Alex Wurz, and Anthony Davidson delivered a best lap 1 minute, 45.214 seconds around the 3.7 mile Sebring track beating the #08 car. 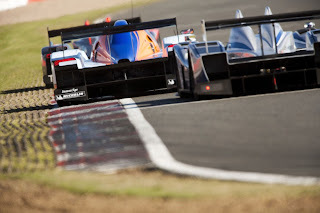 While the presence Peugeot 908 prototypes on the front row is hardly a surprise, the more amazing story of the class comes behind the French team (very closely, in fac). After Friday qualifying at Sebring, the competing prototype Aston Martin-powered Lola has been running on the race favourite Peugeot team. Settling in 3rd place, the Lowes-sponsored LMP #007 car clocked a relatively strong lap 0.8 seconds slower than the lead Peugeot. Even more of a confidence builder for the one-year old Lola-Aston Martin is that they were only 0.238 seconds back of the second diesel-powered Peugeot. The Lola-Aston Martin Team's Principal George-Howard Chappell commented "Third position is exactly where we hoped and expected to be.". Chappell also expresses confidence in the reliability of the #007 car. Rounding out the top 5 for the prototype class is the Drayson Racing #8 Lola-Mazda 1.246 seconds slower and the Patron Highcroft Racing HPD ARX-01c sitting 2.470 seconds behind the leader's time. In the GT2 class the #90 Rahal-Letterman Racing BMW M3 leads the category with a lap time of 2 minutes, 0.782 seconds. However, through post-race inspection the BMW M3 failed a stall test causing their top time to be disallowed. Thereby, the #45 Flying Lizards Porsche 997 RSR inherited the pole in the GT2 class after running 6/10th of a second slower than the disqualified BMW M3. Also with the exclusion of the Rahal Letterman Racing BMW M3, the starting positions of other GT2 cars have been bumped up. With Porsche 997 RSRs starting 1-2, 3rd place in GT2 sees the #62 Risi Competizione vehicle leading the large contingent of Ferrari 430 GT race cars. Struggling for speed through the week against German and Italian-built challengers, the American Chevrolet Corvette C6Rs could only pull off a 4th and 5th place showing on Friday. Corvette Racing program manager Doug Fehan stated after qualifying "We've still got a lot of work to do and we are climbing a steep learning curve. As a testament to the highly-competitive fight shaping by for the GT2 class in Sebring (and likely the entire ALMS season for 2010) 1st through 8th in the class is separated by under 1.1 seconds. As for the two Challenge classes running for the first time at Sebring, the #99 Green Earth Team took the Prototype Challenge series' first pole narrowly beating the #95 Level5 car. Gunnar Jeanette drove the #99 car in the lap which vaulted the team over the #95 car being hustled by IndyCar regular Ryan Hunter-Reay added as a co-driver for the Sebring event. An exciting on track battle for Friday qualifying, the class' main source of heart race occurred on Tuesday. A loss to the new Prototype Challenge class, the ALMS mainstay Intersport Racing team needed to withdraw from the 12 Hours of Sebring after their car wrecked dramatically following a right rear suspension failure. While driver Jon Field was not seriously hurt, their Oreca prototype went airborne and flipped several times. The 7-car GT Challenge field will be led by an #81 Alex Job Racing-owned Porsche 911 GT3 Cup car. To be driven by Butch Leitzinger, Juan Gonzalez and Leh Keen on Saturday, the #80 Alex Job Racing teammate secured the full front row for the GT Challenge. With ambient temperatures in Sebring, Florida slated to peak at 80 degrees Fehrenheit, a hot Florida weekend will heat up the racing surface promising to challenge every driver with a slick race track. 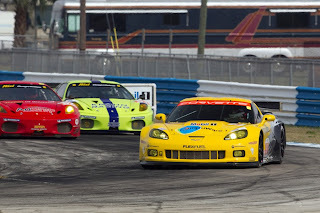 The 2010 12 Hours of Sebring starts at 10:30 AM on Saturday.